The undefeated Alabama Crimson Tide are the overwhelming favorite to win the national title this season. Of course, in order to do so, they still have to defeat Georgia in the SEC Championship this weekend and then win both games in the College Football Playoff. There’s plenty of room for even the best of football teams to slip up or catch their opponent on a very good day. 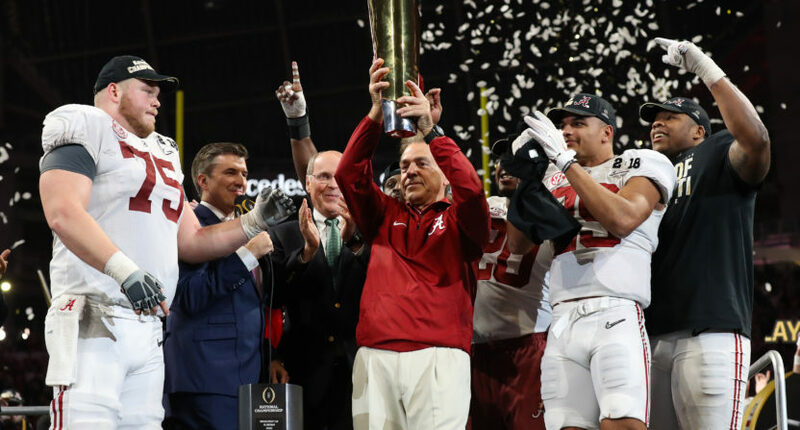 In order words, despite their dominance and the perception that their coronation is a formality, no one should be handing Nick Saban the trophy just yet. Don’t tell any of that to FanDuel. According to The Lines, the sportsbook has decided to go ahead and pay out any futures bet that was made on the Crimson Tide to win the national title this season. If you bet on Alabama to win it all, you’ve already claimed your winnings. Congrats! Any single futures bets on Alabama were paid out to customers today. When taking into account Alabama championship futures that are involved in parlays, the early payout could be nearly $400k. Retail customers with a physical bet slip dated prior to November 30th can redeem it for the full amount starting this afternoon at any FanDuel Sportsbook location. Any future wagers placed on Alabama after 5 PM ET on November 30th do not qualify for an early payout. The early payouts apply to anybody holding a physical ticked on a bet placed at the Meadowlands or on its online sportsbook. In fact, FanDuel indicated that it already credited bettors accounts on the mobile app. Just to drive home how much of a favorite the Tide is, you’d get them listed at -280 if you bet on them right now. Unfortunately for you, it’s now too late to be guaranteed a payout on that no matter what. So what’s the catch here? Why would a sportsbook just give away money on a bet they might not have to pay? Well, you’re reading it right now. The odds are so good that Alabama will win the title, it’s not as risky as it sounds for FanDuel to pre-pay the winners. And then they also get a whole bunch of publicity for doing what they probably wouldn’t have done anyway. Of course, it’s still possible that Alabama could stumble and if they do FanDuel is on the hook for two sets of payouts. But that’s the chance you take in this business.